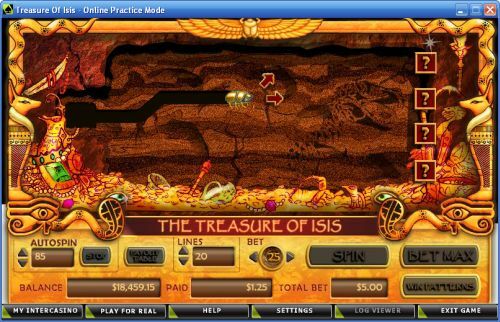 Treasure of Isis Video Slot Review - Casino Answers! Treasure of Isis is a 5-reel, 20-line video slot developed by Cryptologic, featuring scatter wins, free spins and a bonus game. You can play the Treasure of Isis video slot at [Americans: Unfortunately due to legal restrictions you are unable to play at any of the online casinos this game is at. We recommend you trying playing the unique slots at Win A Day Casino instead.]. Bets on the Treasure of Isis slot machine are $0.01, $0.05, $0.10, $0.25, $1, $2 and $5 per line. You can select up to 20 paylines. The minimum total bet you can make on the Treasure of Isis online slot is a penny per spin up to the maximum total bet of $100 per spin. Treasure of Isis has a good betting range and is suitable for casual players as well as high rollers. To play Treasure of Isis, select your bet and press the “Spin” button. Alternatively, you can use “Bet Max” to play all 20 paylines. Treasure of Isis has some amazing payouts. The top one is the Scarab symbol, 5 of which will pay out a very high 40,000 coin top jackpot. The second highest is the Sphinx symbol at up to 15,000 coins. From there, 5 Pyramid symbols will pay out 7500 coins. Finally, the Ankh and Anubis symbols will each pay out 2500 coins for five symbols. You can win big by hitting these jackpots when you play at [Americans: Unfortunately due to legal restrictions you are unable to play at any of the online casinos this game is at. We recommend you trying playing the unique slots at Win A Day Casino instead.]! All wins are paid left to right and right to left. You must bet all 20 lines to trigger the Treasure of Isis bonus game. Payline wins are multiplied by the bet per line. Scatter wins are multiplied by the total bet and added to payline wins. Under “Autospin,” you can select up to 99 autoplay spins on the Treasure of Isis slot game by using the “+” and “-” buttons. You can stop the autoplay mode on Treasure of Isis by pressing the “Stop” button. As far as presentation goes, Treasure of Isis isn’t knocking them dead. It is a little dated now, but it still isn’t horrible. Other than that, the slot has some great payouts that make the video slot very tempting. The bonus game is also a winner and offers some very large cash prizes as well. You can play the Treasure of Isis video slot when you sign up and make a deposit at [Americans: Unfortunately due to legal restrictions you are unable to play at any of the online casinos this game is at. We recommend you trying playing the unique slots at Win A Day Casino instead.]! 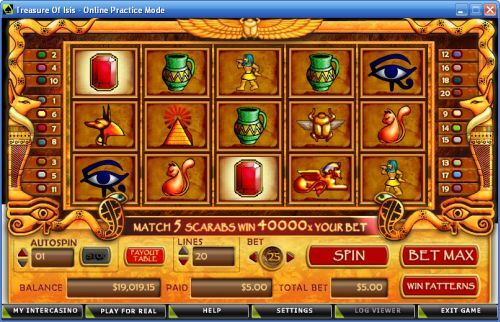 Where can I play more Egyptian themed slot games? For a complete list of Egyptian themed video slots and classic slots, we recommend you read our list of Egyptian slots. Can USA players play the Treasure of Isis video slot for real money? If you are based in the United States of America, you are unfortunately unable to play the Treasure of Isis online slot. We recommend that you play Cleopatra’s Gold or Jackpot Cleopatra’s Gold instead.